This story about diversity in Anchorage schools was co-produced by the Teacher Project, an education fellowship at Columbia Journalism School, and Slate magazine. It is part of a national series, "Tomorrow's Test," that focuses on race and changing demographics in American classrooms. Until the summer of 2014, 16-year-old Florence Mbabazi had spent her life in northern Rwanda's Gihembe Refugee Camp, a sprawl of more than 3,000 mud-brick houses with sheet metal roofs. Her parents, farmers in the neighboring Democratic Republic of the Congo, fled to the camp in 1997 amid a civil war. Florence didn't love all the rules at the camp's school — students had to wear uniforms, and even the girls had to shave their heads — but she was mostly happy. At least there were always things to do. When word finally came in September 2014 that after 17 years, Florence, her mother, and her five brothers and sisters would finally leave the camp for the United States, she imagined the bustle, skyscrapers and glamor of New York City. When she learned she would be moving to Anchorage, she cried. But Anchorage had something to offer that New York City does not: one of the country's strongest education programs for refugee students. 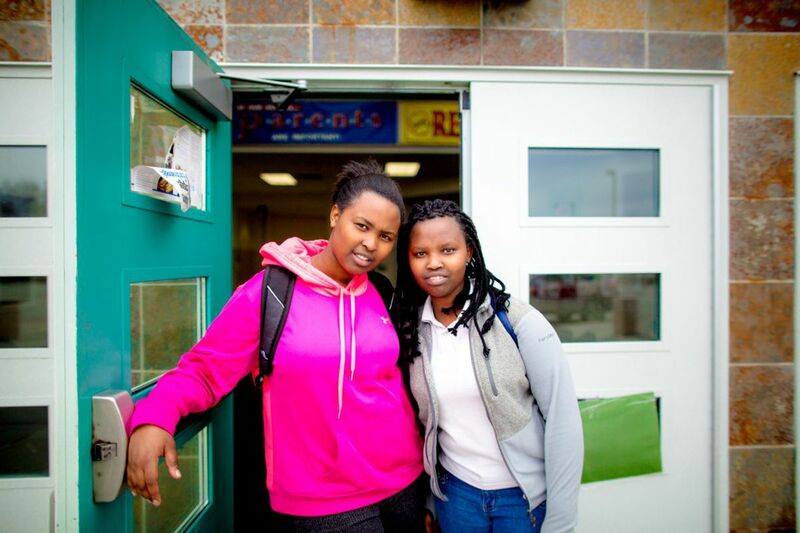 In Anchorage, middle and high school students like Florence and her younger sister, Denise Bamurange, spend half their day at a program called the Newcomers' Center with other arrivals who speak little or no English. They spend the rest of the day at neighborhood schools, immersed with the general student population. By adopting this hybrid approach, the Newcomers' Center does something unusual in the world of English language and refugee education. In some cities, like Atlanta, refugee students get thrown into the general student population immediately, where they often struggle with the language and American social and cultural norms. 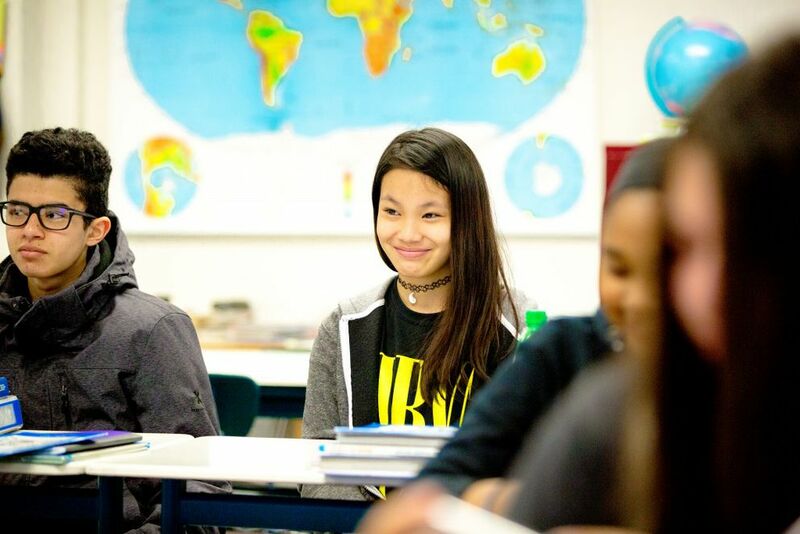 In others, including parts of Maryland and New York, they're isolated from native-English speakers for most or all of the school day — and sometimes fail to ever adapt to the American classroom. "Anchorage seems to be doing it right," said Rebecca Callahan, an English language education professor at the University of Texas. The hybrid structure, she argued, lets new arrivals get comfortable with English and America in a safe space, then try out what they've learned at their neighborhood schools. "Second-language education is large and complex, but then you add the refugee layer and you have psychological trauma and often interrupted schooling," Callahan said. 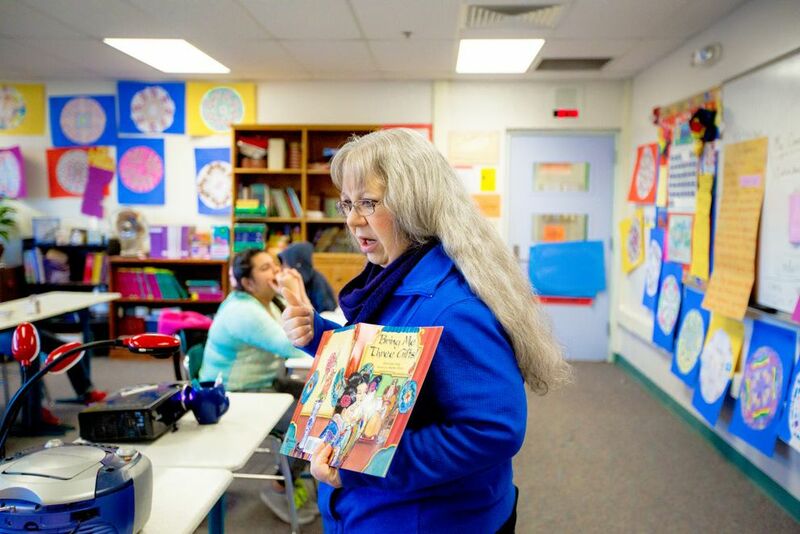 Over the past decade, the Anchorage School District has become one of the most diverse in the country, serving students who speak nearly 100 different languages. Out of 48,000 students, almost 6,000 qualify for English language learner services, though only a small handful need the type of intense programming the city's immersion program provides. 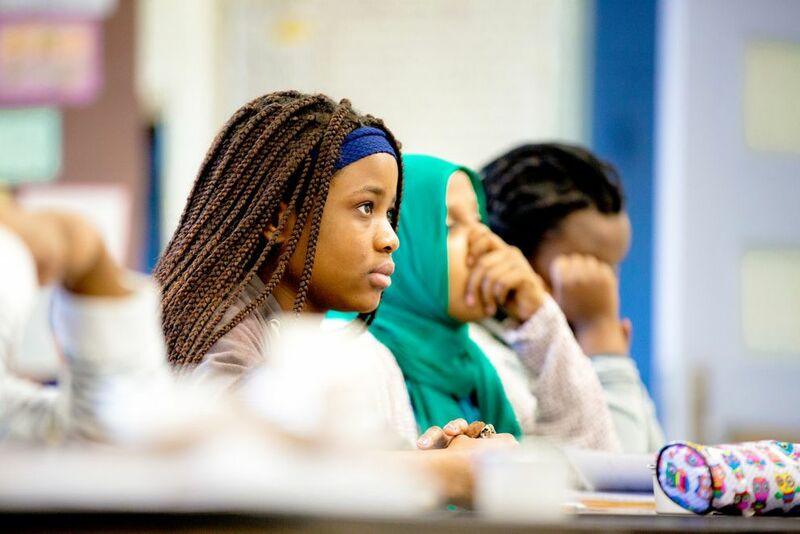 Students at the Newcomers' Center come from countries as varied as Somalia and South Korea and speak languages as obscure as Triqui and Mandinka. And as more school districts across the country grapple with integrating and educating students from a vast array of cultural and linguistic backgrounds, Anchorage and the Newcomers' Center offer a case study in how to help students acclimate with sensitivity and success. Those lessons will become especially acute in coming years. Secretary of State John Kerry said in January that the United States would take in thousands more Central Americans fleeing violence, almost all of whom are children. This is on top of a plan announced last fall by the Obama administration to increase the number of refugees admitted to the United States this year by 15,000, to 85,000. In 2017, the U.S. will admit at least 100,000 international refugees. Almost half of those are likely to be children. About 130 refugees arrive in Anchorage every year. That's not a lot compared with major cities in the United States, but it is significant for a city of slightly more than 300,000. The U.S. Department of State assigns the refugees to Anchorage — the only Alaska city that accepts them — and Catholic Social Services places them and provides services. Historically, most of the city's refugees have come from African countries such as the Democratic Republic of the Congo, Somalia and Sudan, and several have arrived from Iraq and Myanmar. And although Alaska hasn't been assigned any Syrian refugees, Jessica Kovarik, the state refugee coordinator for Catholic Social Services' Refugee Assistance and Immigration Services program, said that's likely to change, since the city is well set up to accommodate Arabic-speaking immigrants. Every year, Alaska also receives several dozen "secondary migrants" — refugees who are sent to other places but move to Anchorage for its economy and jobs in fish processing and tourism. Anchorage wasn't always so diverse. When the Newcomers' Center opened in 1996, it served just 11 students — all of whom were Spanish speakers. Today, it has 87 students from more than 20 countries and who speak more than 15 languages. The center is housed at Wendler Middle School. The hallways are dotted with anti-bullying and diversity slogans, such as "Appreciate everyone and mock no one." Guatemalan immigrant Eliohany Mejia Guzman — just "Hany" to her friends — led a visitor on a tour of the school. Along the way, she stopped at a student who had arrived just days earlier. "He's new," Hany said. "I speak Spanish. He speaks Spanish. So I help him." Teachers say that while such pairings aren't always intentional, students naturally gravitate toward newer arrivals who share their language, helping them adjust and welcoming them to a new and occasionally intimidating environment. The integration program not only helps the students learn English. It also helps them learn to "do school" — a phrase used often by teacher Bonnie Palach. That includes instruction in how and when to change classes throughout the day. While some students have had several years of formal education, others arrive unable to read in their native language and lacking basic math skills. Some students have watched family members die violently; others have bounced from refugee camp to refugee camp. Shirley Greeninger, the refugee liaison for the district, tries in a family's initial enrollment meeting to gauge the refugees' education level — something she said is incredibly difficult to predict. Even within individual countries, education opportunities vary tremendously. Some refugee camps offer almost no education, while others might have comprehensive schooling through the American equivalent of high school. Because the families are often unable to share many details, Greeninger researches the camps and shows pictures from them to staff members to help them better understand and prepare for each new student. In addition to education gaps, the Newcomers' Center was also founded to help immigrant students struggling to adapt to the American school environment. New arrivals may not realize certain behaviors are inappropriate, said Katie Bisson, the immigrant liaison for the Anchorage School District. Newcomers' Center students, especially boys, often stand too close to others, roughhouse in hallways or touch other students without knowing expectations are different in American schools. She said these conversations are often difficult but are integral in helping the students adjust. Palach said it's as much her job to teach students to feel comfortable in American classrooms as it is to teach academic material. "It's a shock to the system for them," she said. "If we don't help them understand how to feel comfortable here, they won't learn, regardless of how smart they are." Florence Mbabazi began school in Anchorage just two days after she arrived in September 2014. Having spent almost all of her life in the small, simple buildings of the refugee camp, she was overwhelmed by the sheer size of the two-story East High School building, where she started off in a Newcomers' Center satellite with dozens of other recent arrivals. Florence and her sister, Denise Bamurange, who is 14, got to swap their school uniforms for jeans, tennis shoes and colorful T-shirts. They let their hair grow out, at least a little. Florence keeps hers in a short afro while Denise wears long, thick braids. At first Florence was constantly lost. Other students were eager to help her, but none knew her native Congolese Kinyarwanda, a language with some 7 million speakers in the DRC and Rwanda, and she spoke very little English. Both sisters are shy, which made them even more reluctant to try a new language. But they had come to the right place for drawing out introverted, timid adolescents with little knowledge of English. From the start, Denise spent half days at the main Newcomers' Center site, enrolled in Palach's class — the lowest level of English. Denise was reluctant to speak in the first few weeks, which Palach said is normal. She doesn't pressure students into talking, while she keeps tabs on their body language and engagement level. Denise "was obviously paying attention, listening, observing and demonstrating that she was engaged," Palach said. To draw her out, Palach used well-practiced strategies. Instead of calling on students directly, she draws names. She also seated Denise next to a student who spoke more English and placed her in smaller groups for speaking activities. After a few months in Anchorage, Florence and Denise's family moved to a new apartment, and Florence started spending her mornings at West High School and her afternoons at the main Newcomers' Center site, closer to her sister. Jeffrey Thurston, Florence's English teacher there, calls her one of the "deepest thinkers" in his class. On a drizzly day in early October, Thurston began a history lesson on native peoples in the United States, telling his students it's "important to understand America's struggles with inequality happened from the beginning." The students broke into groups, each working to explain a different piece of native culture. Florence researched irrigation with another student, occasionally consulting a bulky dictionary that sits on her desk. While Anchorage's program may provide a national model for success, it faces challenges — mostly financial. To help fund its schools, Anchorage relies somewhat on oil revenue distributed by the Alaska Legislature. But now plummeting oil prices and tax revenues have strained the school district's finances. For each of the past three years, the Anchorage School District faced budget shortfalls of about $20 million, forcing the district to cut jobs and programming. The Newcomers' budget is $350,000, not counting the cost of facilities or busing, with a few additional dollars added for supply and textbook upgrades annually. While the center didn't take any direct hits this school year, the counselors at almost all neighborhood schools who worked directly with Newcomers' students were laid off, leading to wide variation in the services newly arrived students can expect in their home schools. The district also cut back on training for general education teachers on how to work with students who speak no or little English. The laid-off counselors had helped the students transition between schools while attending the Newcomers' Center. 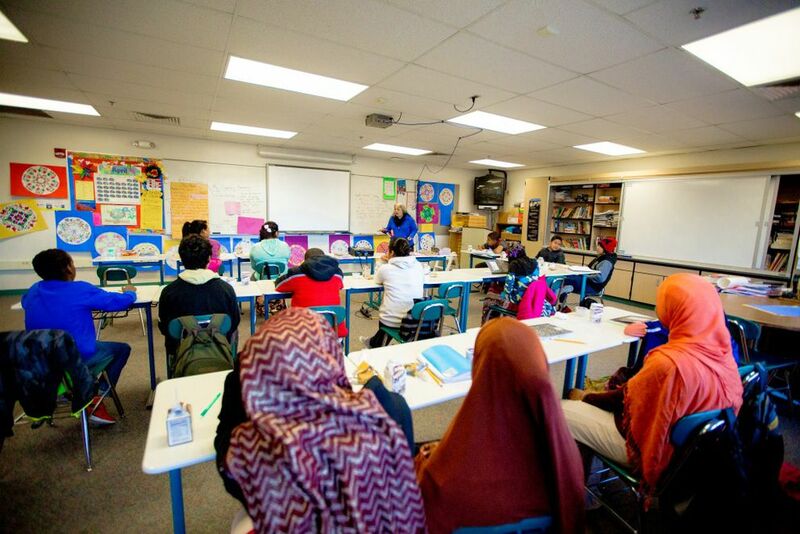 These inconsistencies worry Philip Farson, the director of the Anchorage School District's English Language Learners Program, who said the district currently has no structured way of tracking students when they leave the Newcomers' Center to spend full days in neighborhood schools. "We don't want them to be placed into the low and slow classes just because schools don't understand who they are," he said. Anchorage's model remains better than many of the alternatives, however. Annie Duguay is the associate director of pre-K–12 English language programs at the Center for Applied Linguistics, a nonprofit in Washington, D.C., that focuses on language and bilingual education. She said immigrant students can become too isolated if they spend their whole school day segregated from other students. And although Duguay also suggested that poor teacher training has been part of the problem nationally, Anchorage seems to have dodged this issue. While none of the current teachers at the Newcomers' Center were required to have English language learner certification when they were hired, that wasn't a problem, said Farson, since all of the teachers have been on the job so long that they've learned how to teach the students. Even as resources begin to fray, the Newcomers' Center staff is confident they've found a method that works. 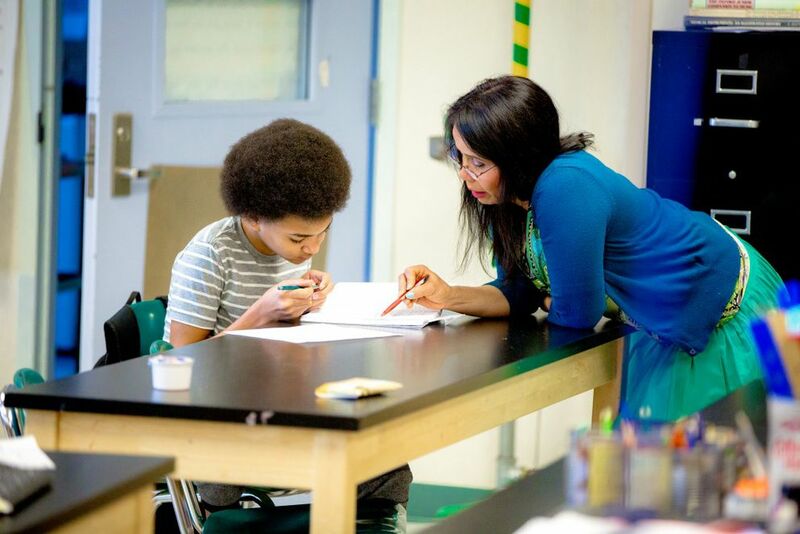 Although teaching there can be "difficult, challenging, frustrating, demanding, and energy-draining," Palach said, the connections she and her students make are worth the struggle. In her second year at the Newcomers' Center, Denise Bamurange's English has improved tremendously, so she's moved up to Jessica Stern's middle-level English class. One fall morning, the students slurped juice boxes and ate cereal while Stern readied an assignment on editing marks the students would use to correct letters they'd written to their families. Denise tentatively volunteered to read the first example. "She is are happy," read Denise, giggling at the mistake, and then instructed the class to put a slash through "are." Denise breezed through the letter-writing assignment — writing two of them by the end. While the rest of the class marked up their letters with Xs and slashes, Denise gasped at her only mistake — an incorrect capitalization. The rest of the family has been settling in as well. The girls' father died years ago at the refugee camp. But with the help of Catholic Social Services, both their mother, Felicite Nyiratebuka, and older brother, Hambifura Ndayikunda, found jobs. The mother, who speaks very little English, cleans equipment at a gym. She attends classes daily at the local Catholic refugee center, learning English and gaining job skills. The school district, which makes a point of hiring refugees to inspire the students, gave Ndayikunda a job helping special needs adults in a district vocational school. (His family cobbled together enough money to finish high school and learn English before leaving Rwanda.) He has a second job at night washing dishes in a restaurant. Next school year, Florence will transition out of the Newcomers' Center and spend full days at West High School. She feels good about that. "My English is better now, and I think I'll be OK." Denise will be in high school next year, and the staff at the Newcomers' Center is still deciding whether they'll keep her in the program for an additional semester or allow her to go to West full time. Both Florence and Denise agreed that the Newcomers' Center was central to helping them feel at home in Alaska. Surrounded by peers with similar struggles and tumultuous backgrounds, they say they felt comfortable making friends and pushing their limits. The Newcomers' Center gave them their first feeling of community and belonging in a strange new land. And although Florence was disappointed when she looked at the map two years ago, she now realizes the bustle of a big city would have been too overwhelming. In just a couple of years, she hopes to attend college in the Anchorage area, close to family and to the place she now calls home.